Most CBGs use "open chord" tuning, which means you are able to play a set of 3 or more notes by placing your finger or slide across all the strings at the same spot on the neck. The lowest string is the key your guitar is tuned to. G-D-g is the key of G, D-A-d the key of D.
On four-string CBGs the tuning options are expanded, including not only standard CBG tuning but also any 4-string instrument one prefers: bass guitar, low 6-string guitar (EADG), high 6-string (DGbe), ukulele, mandolin and even violin. Common 4-string CBG tuning is GDgd or GDgb. Tune the first (heaviest) string to whatever sounds and feels right. This should usually be a little lower and looser than you think it should be. The 2nd string (middle) is tuned the same as the 7th fret on the 1st string. The 3rd string (thinnest) is tuned to the 5th fret of the 2nd string. CBGs aren't limited to 3 or 4 strings. Some have 6 strings, like a regular guitar. Some have only two or even one string (called a "Diddley Bow"). Two Diddley Bows can be tuned to harmonic notes (G,D) and the players can automatically harmonize with each other by playing the same neck positions. CBGs are extremely versatile instruments and are remarkably easy to get started playing. Among CBG players and builders there is one common rule: "There are no rules." 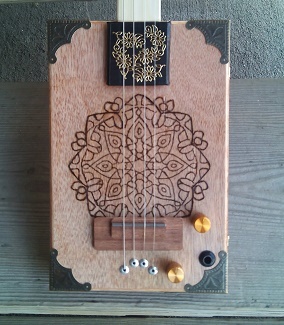 That's part of what makes Cigar Box Guitars so much fun: their widespread individuality and unique nature.